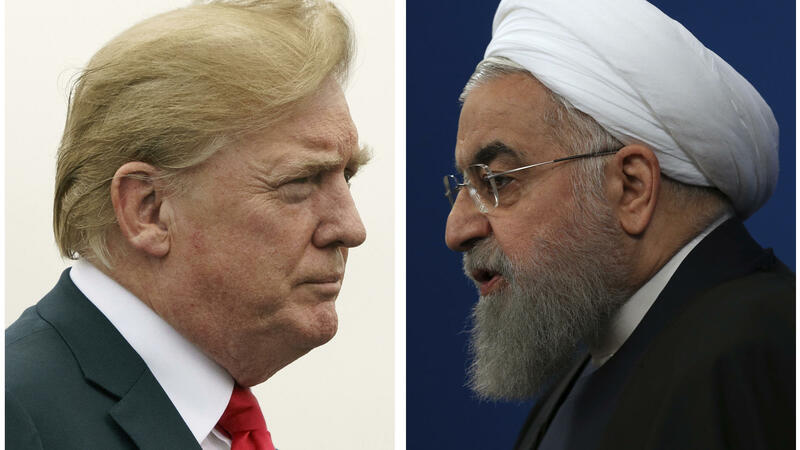 President Trump issued a strongly worded all-caps, late-night tweet after Iranian President Hassan Rouhani (right) said that war with Iran would be "the mother of all wars and peace with Iran is the mother of all peace." He declared, "WE ARE NO LONGER A COUNTRY THAT WILL STAND FOR YOUR DEMENTED WORDS OF VIOLENCE & DEATH. BE CAUTIOUS!" At a gathering of Iranian diplomats in Tehran on Sunday, according to Iran's state news agency, Rouhani said, "America should know that peace with Iran is the mother of all peace, and war with Iran is the mother of all wars." Iran can defend itself, Rouhani added, hinting that his country could also affect oil shipping through the Strait of Hormuz in the Persian Gulf if it were to come under attack. As for how Trump's response has been received, Iran's state news agency said the tweet was typical of the American president's "bullying words." NPR's Peter Kenyon reports some people have pointed out that "you can't really do all-caps in Persian, that doesn't quite translate. But no mistaking the threatening nature of the message." Democrats on the House Foreign Affairs Committee tweeted a retort to the president's message, saying, "DON'T BE DISTRACTED BY ALL CAPS. WE'RE NOT ATTACKING IRAN." They then urged Trump to hold Russia responsible for interfering in the 2016 U.S. election. Also on Sunday, Secretary of State Mike Pompeo launched a blistering attack on Iran in remarks at the Ronald Reagan Presidential Library in California. Pompeo accused Iran of corruption and mismanagement at the highest levels and said the country had backed terrorist attacks in Europe even as it tried to reassure EU members that Iran will follow restrictions in their nuclear agreement. In pointed remarks, Pompeo said Iran's supreme leader, Ayatollah Ali Khamenei, controls a hedge fund valued at $95 billion — a fund called the Setad (and on which Reuters did a special report in 2013). "That wealth is untaxed, it is ill-gotten, and it is used as a 'slush fund' for the IRGC [Islamic Revolutionary Guard Corps]," Pompeo said. "The level of corruption and wealth among Iranian leaders shows that Iran is run by something that resembles the mafia more than a government." Pompeo also tweeted a succession of messages in Farsi, trying to bring his message directly to any Iranians able to skirt their country's censors. In them, he said Iran's 1979 revolution had borne "bitter fruit." Pompeo said, "After 40 years of tyranny, the proud Iranian people are not staying silent about their government's abuses. We will not stay silent either." In Tehran, Rouhani questioned whether the U.S. can embrace Iran's people while fighting its government, saying, "There were no times in the past like today that we are witnessing the White House acting against the international law, Islamic World and Palestinian people." Trump's tweet prompted questions about what the president meant by "consequences" for Iran, aside from the economic sanctions the U.S. is already set to reimpose after leaving the Iran nuclear deal. On Monday morning, the White House released this statement from national security adviser John Bolton: "I spoke to the president over the last several days, and President Trump told me that if Iran does anything at all to the negative, they will pay a price like few countries have ever paid before." The timing of Trump's heated remarks also raised the question of why he decided to issue his tweet late Sunday — after a week of negative attention for his meeting with Russian President Vladimir Putin last Monday, and the revelation that his former attorney Michael Cohen recorded him in 2016 discussing payments to a woman who claimed she had an affair with Trump. "Donald Trump likes to direct the media narrative, to control it," NPR's Mara Liasson said on Morning Edition. "And he's gotten us all talking about Iran this morning, instead of talking about Putin, or the investigation into Russian interference." Mara noted that Trump also directed violent language toward North Korea — before meeting with Kim Jong Un in Singapore. "Sometimes he likes to create a crisis, and then become the hero of his own story and declare the crisis over," Liasson said. In the case of North Korea, she pointed out, the crisis was declared over despite any nuclear weapons being dismantled.